Why would anyone make normal pancakes when you could jazz them up and make a special ombre stack of pancakes? 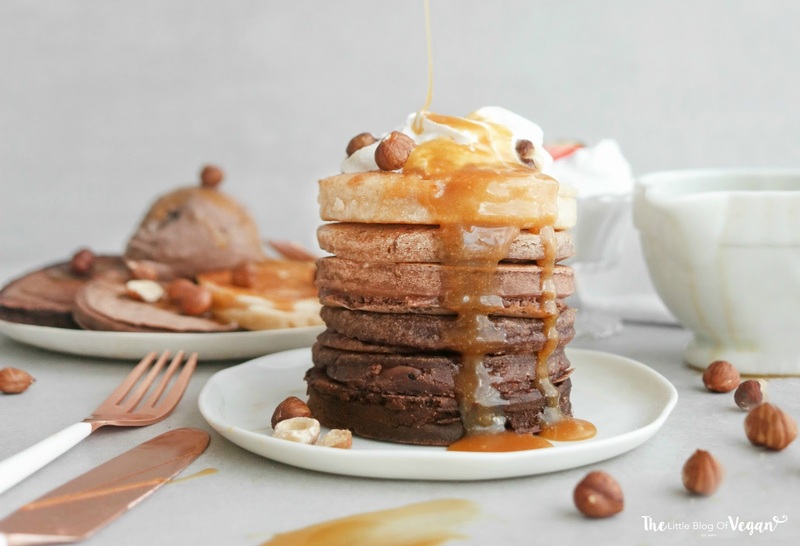 These easy chocolate ombre pancakes are full of chocolaty flavour, topped with a creamy butterscotch sauce, vegan cream and roasted hazelnuts for crunch. 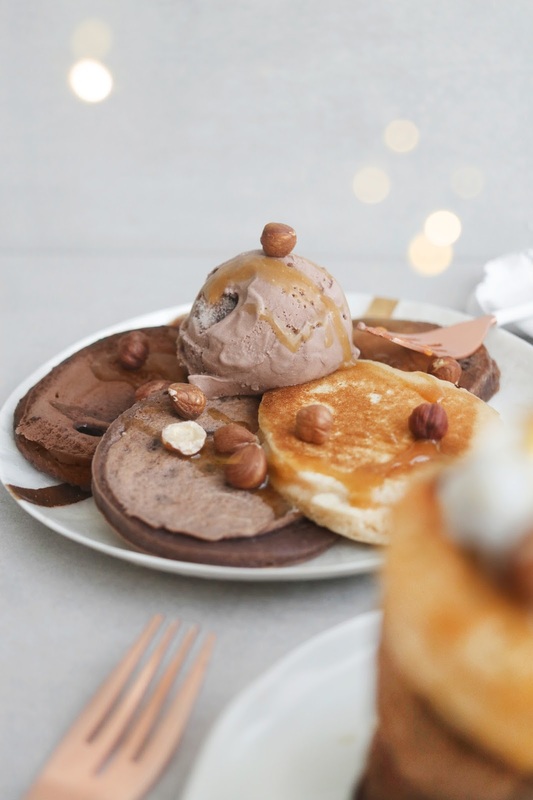 The pancakes go from rich chocolate to a plain vanilla, delicious! I decided to top off the pancakes with a drizzle of the Natures Charm 'Butterscotch' sauce. This sauce is 100% vegan, dairy-free, gluten-free, wheat-free.....and scrumptious! It's made with coconut oil and premium coconut milk which makes it extra silky smooth and irresistible. I'm not kidding when I say it's irresistible...when I first opened it I grabbed a spoon and had a cheeky nibble, haha! 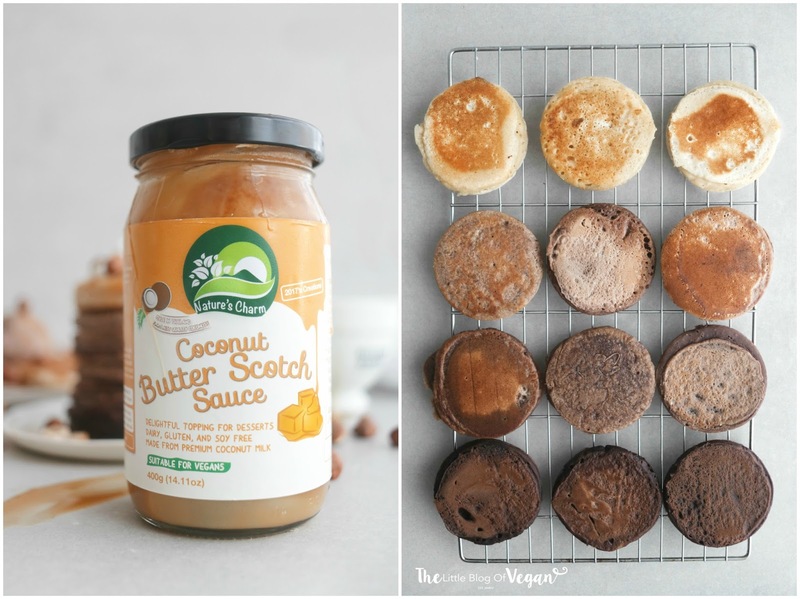 It's the perfect sauce to dress up your pancakes! 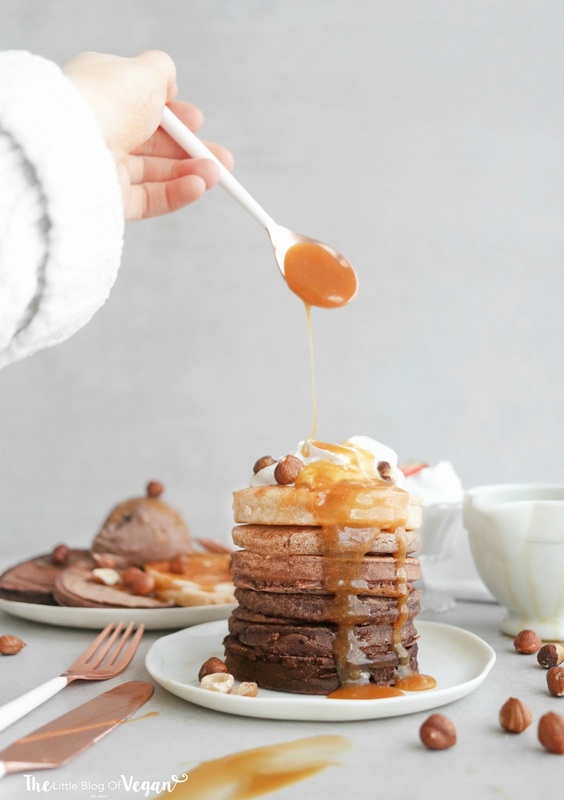 They also have a range of different sauces including caramel, chocolate fudge (which would work wonders with these chocolate pancakes) and a matcha green sauce! 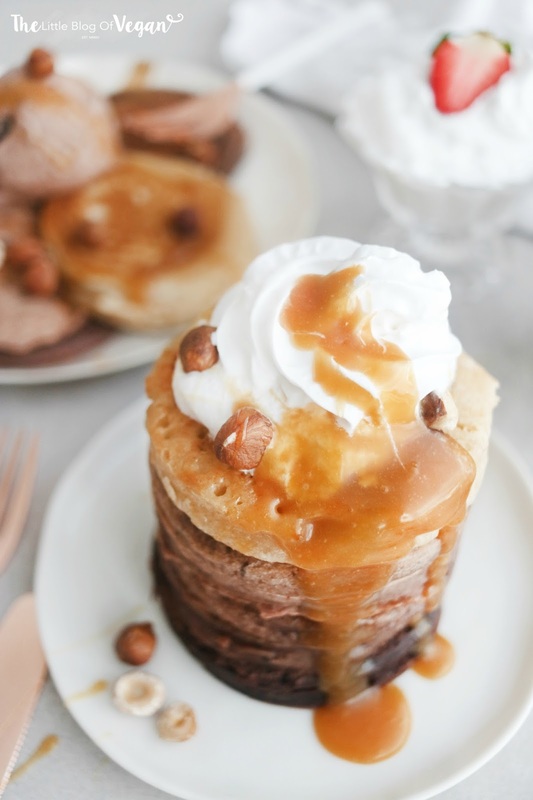 These pancakes are quick & easy to make, perfect to wake up to on Pancake Day!!! They're 'flipping' amazing (I couldn't resist making this pancake pun). Step 2- In a separate bowl, add in the dairy-free milk and oil then mix. Step 3- Combine the wet and dry mixture together until smooth. Step 4- Divide the batter into 4 different bowls. In the first bowl, add 1 tablespoon of cacao or cocoa powder. Stir until it's incorporated. In the second bowl add in 1 teaspoon of cacao or cocoa powder. Stir until incorporated. In the third bowl, add in a dash of cacao or cocoa powder and mix. Leave the last bowl as it is, plain. The batter should transition from dark to light. Step 5- Heat a tablespoon of oil in a frying in. Step 6- Spoon the batter into the pan, about 2 tablespoons at a time. Cook for around 2-3 minutes until the edges of the pancake turn golden then flip and repeat. Step 7- Once cooked, serve. 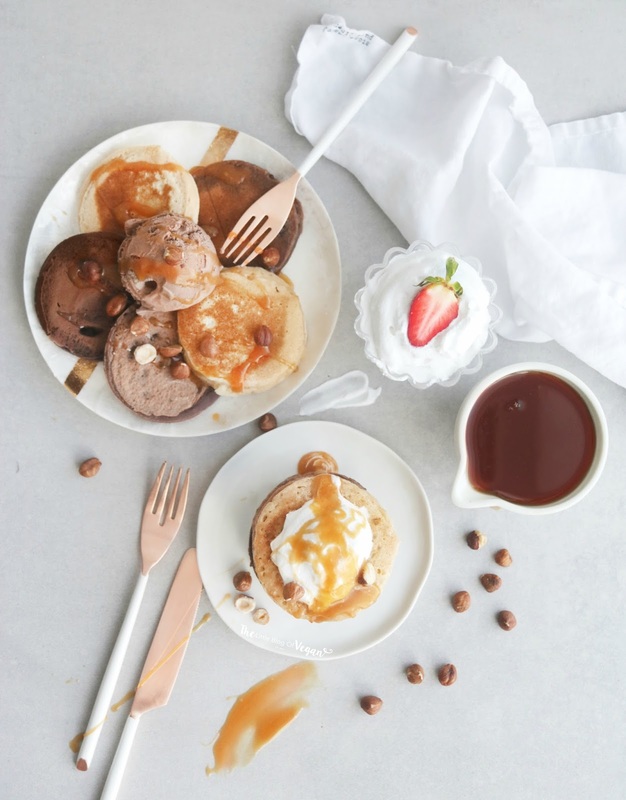 I served my pancakes warm with a swirl of vegan cream, a drizzle of butterscotch sauce, hazelnuts and dairy-free chocolate ice cream.